Paternalistic, inaccurate headline and disdain for evidence aside, last Sunday’s article on the proposed NHS voucher scheme was disturbingly biased. Essentially, it fuels the ongoing ‘experience vs. safety’ debate-which-isn’t-a-debate, by not so subtly suggesting that choice – especially of place of birth – is just misinformed women being self indulgent and/or irresponsible. Below is my letter to editor, (which regrettably there was not enough room to publish, as he had received numerous letters on the subject). Three other letters to editor – from Sam O’Brien (not published), Beverley Beech (published in part) and Dr Tracey Cooper (not published) – are also posted below. I’m writing to redress the balance of Sunday’s ‘Mothers-to-be may get right to home birth’ – a headline implying we don’t already have the right to home birth, which we do. The European Convention on Human Rights, Article 8 protects every person’s right to respect for their autonomous choice about private life, including the woman’s right to decide the circumstances and location in which she gives birth. A better headline could be ‘mothers-to-be may get respect for right to home birth’. But not just the headline is problematic. 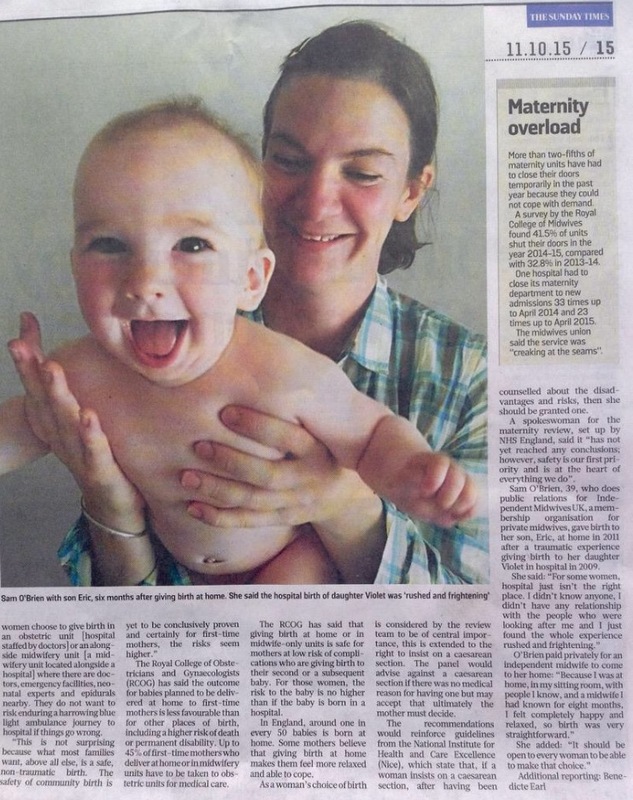 Templeton’s piece is angled to undermine the National Institute for Health and Care Excellence’s recommendation that healthy women with uncomplicated pregnancies give birth in community or midwife-led settings (NICE, 2014). It overlooks the compelling evidence base supporting a salutogenic approach to childbirth, optimising physiology, avoiding intervention and the contribution of midwife-led care to improving quality and safety in maternity (Sandall et al, 2015, Hodnett et al, 2013). Instead, the article is weighted towards the perspectives of Birth Trauma Association’s Maureen Treadwell, spuriously claiming “the safety of community birth is yet to be conclusively proven” (what about Birthplace, 2011, Blix et al, 2012 and the other studies in NICE, 2014? ), Care Quality Commission patient safety advisor James Titcombe and “doctors who believe the experience of birth is being promoted at the expense of safety of babies and mothers”. What childbearing women need and want for themselves and their newborn infants is to be healthy, safe, supported, respected and to give birth to a healthy baby that can thrive, after a positive and life-enhancing pregnancy and birth experience, whatever complications they may experience (Lancet, 2014). ‘Experience’ and ‘safety’ are intrinsically linked, and cannot be separated, let alone opposed, as suggested by Titcombe and Treadwell. High quality, safe maternity care includes – and goes beyond – measuring mortality and morbidity, to encompass multiple outcomes, of which women’s experience is one. A woman is prioritising safety of the mother-baby dyad by trying to guarantee the ‘experience’ of continuity of care and the place of birth where she feels safe and relaxed – and where the evidence base tells her it is safe to birth. Medicalisation is not necessarily synonymous with safety. Women are not sacrificing safety for experience when they make the informed choice to birth outside obstetric units, avoiding increased risks of iatrogenic harm caused by interventions. Women make these choices based on individual interpretation of risks and benefits – which are physiological, psychological, emotional, social, spiritual, and vary from woman to woman. Safe and compassionate maternity care needs to anticipate and reflect these risks and benefits for individuals. Sadly, the article points towards the misogynistic and misguided notion that all this choice is just self indulgent and reckless, which it absolutely is not. Olivia Armshaw, newly qualified midwife. 1. Sam O’Brien, (the mother in the photograph accompanying the original article) writes: “When fighting for safety in birth, the experience matters.. Never have I felt less safe than when I was on the receiving end of a violent blur of procedures”. Read Sam’s letter here, which the Sunday Times did not include, but which she emailed to me. 2. 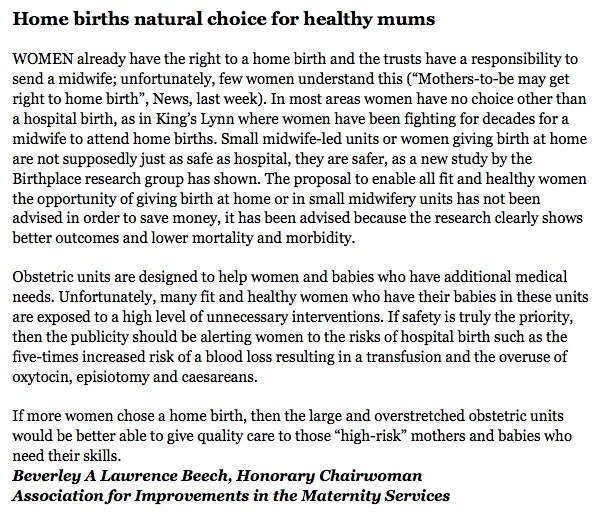 Beverley Beech, (chairwoman of AIMS) calls out the ‘safety’ propaganda: “If safety is truly the first priority, then the publicity should be alerting women to the risks of hospital birth..” Read Beverley’s letter in full here – it was published in part by Sunday Times (paywall). 2. 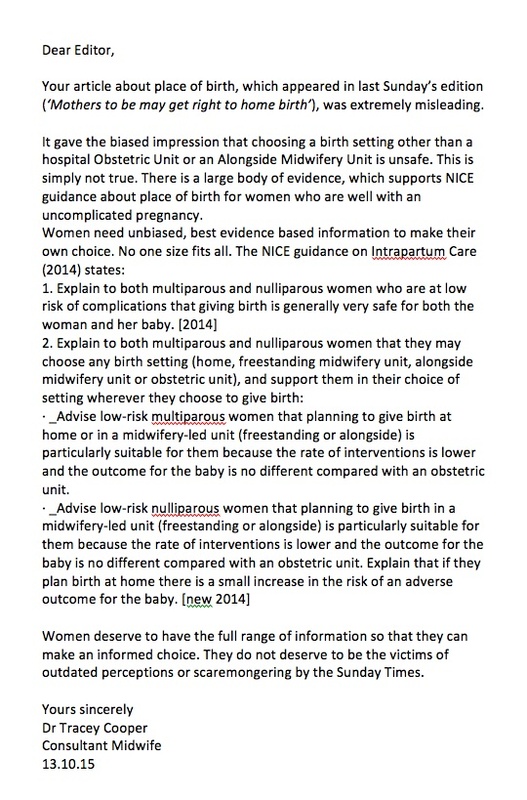 Dr Tracey Cooper, (consultant midwife) proposes NICE guidelines advice on place of birth are more appropriate for women than “outdated perceptions or scaremongering”. Click to enlarge Tracey’s letter which the Sunday Times did not include, but which she emailed to me. 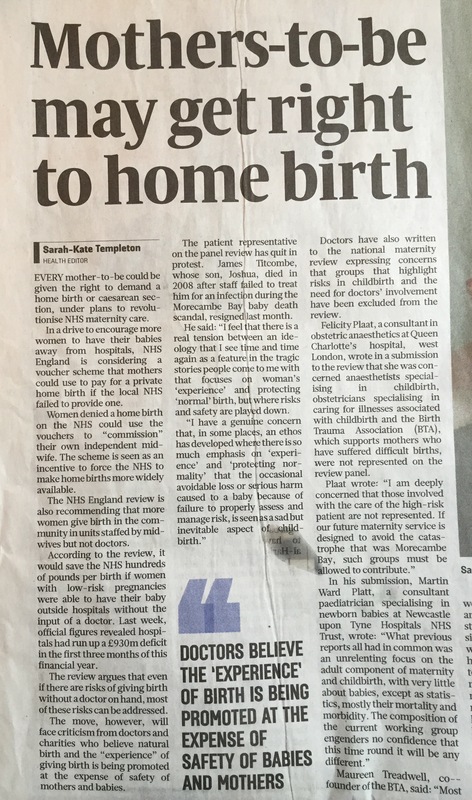 I was also relieved to read Milli Hill’s comment in The Telegraph, decrying the oversimplistic ‘safety versus experience’ argument: “Home births are not just for mad maternity evangelists – thanks NHS”. 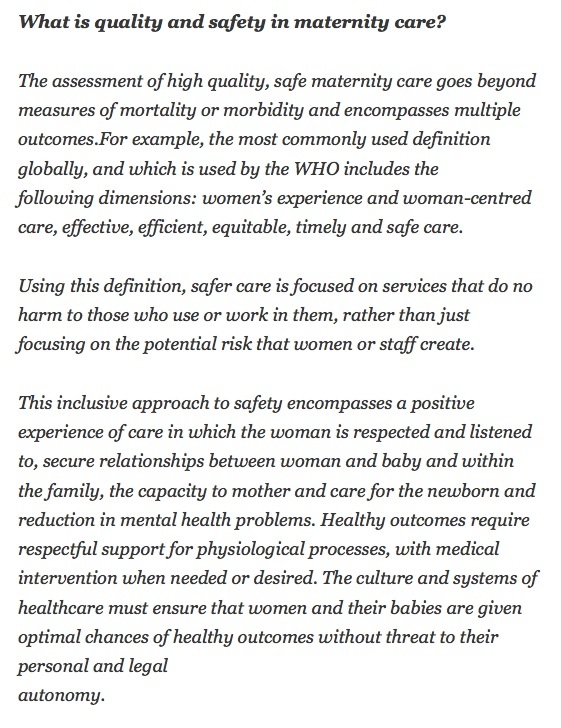 To conclude this post, here is a reminder of the relationship between safety and experience as clearly defined in Birthrights’ letter to the NHS Maternity Review, which lights the way on autonomy, dignity and human rights in maternity care. Very interested to read this piece which has just been forwarded to me. I agree with all the points you make about the importance of the psychological impact of birth and respect for women’s choices. Choice though, depends on correct evidence. There is low grade observational evidence that when low risk women who have had a previous baby want to give birth in a community setting, then that is as safe as a hospital and they have a lower likelihood of interventions. However, there is not the evidence to support this for first time mothers. The Birthplace study asserted this and it is simply wrong. A fuller explanation is on this link in the BMJ http://www.bmj.com/content/349/bmj.g7776 The RCOG have also raised concerns. Where the data was properly returned and the Birthplace researchers adjusted for the considerable excess of women with complications at the start of labour, the study showed a doubling of risk for first time mothers in free standing midwifery units (OR 2.29) and an even higher risk for home birth (4.65) (Table 59 ). Moreover the deaths and brain damage – the more serious outcomes – were a higher proportion of the ‘composite outcomes’ for non-obstetric birth. What we need is more robust evidence to say one way or the other. At the moment we don’t have it and the best evidence we do have points to a small increase in risk for first time mothers in community settings. However, the risk is small, so if a mum really would feel safer at home or in an FMU then that is fine. What we shouldn’t though, be doing, is asserting safety because the trend in the data we have doesn’t support that. I would be more than happy to talk you through the data in detail. NICE guidelines are developed by a multidisciplinary team of research fellows, midwives, women and doctors following the NICE MANUAL principles and social value judgements – all framed to minimise bias and ensure the highest possible standard of work. 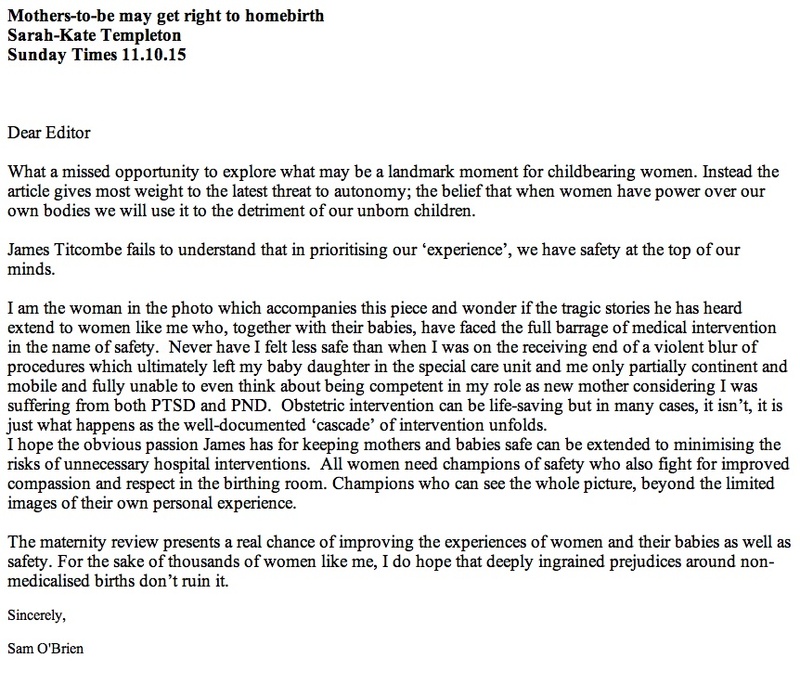 Important to refer back to Sam O’Brien’s letter too, which articulates the pain and un-safety that unnecessary interventions can cause, and why it’s essential that women are giving birth in settings appropriate to their needs. Not to mention that we listen to women. So glad to read this Oli and here is my response to the article. The ‘fear-mongering’ of media and journalistic experts goes a long way in producing a sense of doubt and disbelief in women’s minds and bodies. The subject of my research over the last 5 years is around the phenomenon of childbearing fear. This area of research has gathered pace of late and it seems to me that women are increasingly subjected to those who know better than them. Doctors react to this and therefore weight their advice to ‘protect’ women and their babies. It is no surprise to me that the consequence of this is that no one wins least of all women. Evidence is overwhelming for supporting women’s choices – the problem is that it seems they are the ones we least listen to. The NICE recommendations about Place of Birth in the Intrapartum Care guideline (2014) are based not just on The Birthplace Study (Hollowell 2011) but other studies too. They did systematic reviews on comparisons of one place of birth versus the other, therefore looked at lots of studies e.g 13 when comparing AMU with OU, 8 studies when comparing FMU to OU, and 15 studies when comparing home to OU. There is also inclusion of qualitative data on womens experiences when developing the recommendations. Please read all of Chapter 3, including the evidence tables in the NICE Intrapartum Care Guideline (2014) to understand the amount of studies reviewed. The Birthplace study was a cohort study ensuring women were able to choose the place of birth they wanted. It was included in all of the comparisons because it was the only study to include all places of birth. It was based on 64,000 women with uncomplicated pregnancies, the biggest study on place of birth in the world, which is current (2011) and performed in the Uk, therefore highly relevant to our population. It was also based on the place where labour started for each woman, which is important. It was a cohort study – a RCT would be highly unethical as women want to choose where to have their baby and plan for it, not leave it to randomisation when they are in established labour. The uptake by women for a RCT would probably be extremely low due to the reasons of wanting to choose themselves what is right for them. It would therefore be virtually impossible to gain the depth of detail we now have. The thing is, how much evidence is enough? We have masses of it already!